What is the spleen? What is its function? Where is the spleen? What does it look like (picture)? What type of pain does an enlarged spleen cause? Where is the pain located? What are other signs and symptoms of an enlarged spleen? What causes an enlarged spleen? What tests diagnose an enlarged spleen? What is the treatment for an enlarged spleen? Are there natural treatments? What complications are associated with an enlarged spleen? What is the prognosis for an enlarged spleen? Can you live without it? Can an enlarged spleen be prevented? An enlarged spleen is not normal and occurs because of another underlying disease. Cancers, for example, lymphoma and leukemia. Liver diseases (cirrhosis due to excessive alcohol use). Inflammatory diseases (rheumatoid arthritis, sarcoidosis). Infiltrated diseases (Gaucher disease, amyloidosis). Pain in the upper abdomen that may radiate to the back or shoulder blade. Treatment for an enlarged spleen is directed to the care of the underlying condition. The prognosis of someone with an enlarged spleen depends upon the underlying condition. Is a major blood filter, which helps remove old and damaged red blood cells, and bacteria. Is part of the lymphatic system and produces lymphocytes. (A type of white blood cell that are a part of the immune system that helps to prevent and fight infection). Acts as a reservoir for red blood cells and platelets, should the body need them. 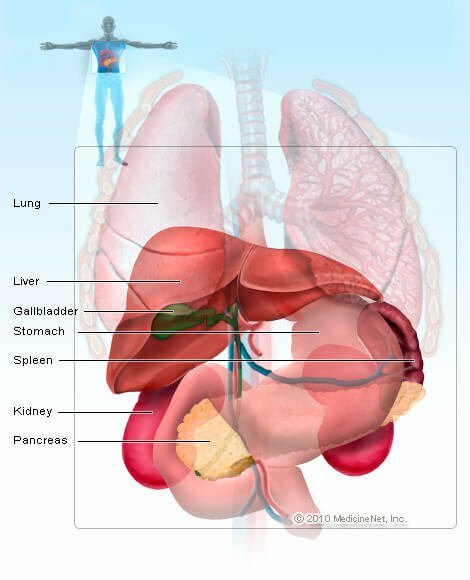 The spleen is located in the left upper quadrant of the abdomen, just beneath the diaphragm and next to the stomach. It has a very rich blood supply since it is responsible for filtering blood, and it is protected by the 9th, 10th, and 11th ribs. Normally, it is the size of an orange or a small fist. The spleen has two types of tissue; the red pulp is responsible for filtering blood, while the white pulp is responsible for its immune function. Because of its location, should it enlarge, the spleen can irritate the diaphragm and cause hiccups and perhaps some pain in the left upper quadrant of the abdomen. Because its location adjacent to the diaphragm, pain from the spleen may radiate to the back and be felt in the shoulder blade. If the enlarged spleen compresses the stomach, the person may feel full after eating a small amount, and therefore are unable to eat large meals. Indigestion and a feeling of fullness because the enlarged spleen can compress the stomach. Hiccups because of diaphragm irritation. Ineffective white blood cell function may cause infections more often. Heavy periods (menstrual) that are unusual. Bleeding that will not stop. The spleen will enlarge when it performs more of its duties to filter blood or to manufacture blood cells. Therefore, any disease or condition that damages red blood cells, and requires them to be filtered and removed from the blood stream, will cause the spleen to become larger. Conditions such as hemolytic anemia, where red blood cells are damaged and broken down (hemolyzed) can cause the spleen to enlarge. Misshapen red blood cells, like those found in sickle cell disease, thalassemia, and spherocytosis, may be damaged when they try to squeeze through small capillary blood vessels. These damaged red blood cells need to be culled from the bloodstream and are filtered out by the spleen. The spleen will enlarge if there is a decrease in blood flow through the splenic vein. This may cause spleen congestion and enlargement. This situation may be associated with liver disease and portal hypertension. Damage to liver cells makes it difficult for blood to flow normally, and as blood backs up in the portal vein system, it may affect pressure in the splenic vein. The decreased ability of blood to drain from the spleen causes it to become congested and grow larger. People with congestive heart failure may have an enlarged liver and spleen because of poor blood flow to and from the heart. Leukemia and lymphoma may be associated with abnormal white cells that can invade the spleen and increase its size. Other cancers can spread or metastasize to the spleen and cause it to enlarge. Certain metabolic diseases may cause the spleen to enlarge, including Hurler Syndrome, Gaucher disease and Niemann-Pick Disease. In sarcoidosis and amyloidosis the spleen can be involved and become enlarged with the abnormal protein deposits. Trauma, for example, from a car accident, can damage the spleen. An enlarged spleen is most often found on physical examination. Either the health care practitioner is looking for an enlarged spleen because of a diagnosis that has already been made, or it is found incidentally when initially examining a patient (and it then serves as a clue to an underlying diagnosis). With its location protected beneath the left lower ribs, a normal spleen is usually not felt on physical exam, except in some unusually thin individuals. As it enlarges, the spleen grows from the left upper quadrant of the abdomen towards the umbilicus (the belly button). Sometimes the doctor will ask the patient to roll on their right side to better attempt to feel the spleen. An enlarged spleen may not be felt in obese patients. On occasion, an enlarged spleen may be diagnosed by plain X-ray, ultrasound, abdominal CT scan, or MRI (magnetic resonance imaging). Because splenomegaly is due to an underlying illness, treatment will depend upon the primary cause. In some situations, removal of the spleen (splenectomy) may be part of the treatment. For example, in hereditary spherocytosis, a condition in which red blood cells are abnormal and shaped like a sphere instead of the concave disk shape. These abnormal red blood cells are filtered from the blood stream, which causes anemia and an enlarged spleen. Splenectomy limits the number of red blood cells destroyed and helps treat the disease. There are no natural treatments for an enlarged spleen. Perhaps the most important worry with an enlarged spleen is the risk of injury as it grows beyond the protection of the rib cage. A minor injury may cause it to rupture and bleed. Spleen injuries are often treated by observation, but on occasion, the spleen can rupture causing life threatening internal bleeding requiring surgery for to remove the spleen. This is the reason that teenagers and young adults diagnosed with infectious mononucleosis need to wait until the spleen returns to its normal size, and is protected by the rib cage, before participating in activities where the enlarged spleen could be damaged. Low platelet count (thrombocytopenia) may be associated with an increased risk of bleeding. Leukopenia (low white blood cell count) may be associated with an increased risk of infection. Should the spleen need to be removed surgically (splenectomy), the risk of certain infections increases, and the patient will need to make certain that their immunizations are up to date, especially against pneumococcus, meningococcus and haemophilus influenzae. Often, the prognosis for an enlarged spleen depends entirely upon the underlying illness. For example, in patients with infectious mononucleosis, the spleen will return to its normal size once the infection resolves. In some instances, the spleen may need to be removed and the risk of infection may increase. In other cases, the spleen will remain enlarged and leave the patient at an increased risk for bleeding, spleen rupture, and infection. An enlarged spleen is the consequence of an underlying illnesses, many of which may not be anticipated or prevented. Liver disease due to alcohol abuse, which causes cirrhosis and portal hypertension, can be prevented. With alcohol use, moderation is the key, and excessive drinking has very dangerous consequences both in the short and long term. Certain causes of viral hepatitis (for example, hepatitis B and hepatitis C), which can lead to cirrhosis also can be prevented by avoiding contact with body fluids from infected individuals. Hepatitis B can also be prevented through vaccination. Finally, certain infectious diseases such as HIV, malaria, tuberculosis, and anaplasmosis can be prevented if the appropriate measures are taken to minimize the risks of acquiring the disease. Rakel RE, Rakel DR. Textbook of Family Medicine. 9th edition. Saunders. 2015.